A few weeks back, I asked people to fill me in on their favorite weather words. This wasn’t just for personal curiosity; I was planning to use them in the piece to generate morse code melodies. I got way more responses than I would have expected, so I figured I should go the extra mile. So, as a thank you to everyone who shared the words, here are my friends’ favorite weather words as a bass line. The words, in order, are listed below. For someone who is making a piece of music based on the weather, I had to look up a ton of these, which really made my day. You made it all the way down here? Maybe you’d like to contribute to the project’s indiegogo page. Also, give the actual piece a listen! You might even hear some of these words spelled out by the bassline. Maybe you’d like to contribute to the project’s indiegogo page or give the actual piece a listen! First off, please do come out to the show on Thursday at MoHA. It’ll be fun! Secondly, if you’re planning to come to the shows on June 3rd, you can now preorder tickets via the project’s indiegogo. If you’re coming to the show, you can also preorder some snacks for you and a friend. I’m also excited that the event is being sponsored by 4th Tap Brewery, and we’ll be serving some of their beers during the show. Thirdly, if you live outside of the Austin area, but would like to support the project, you can still do so. 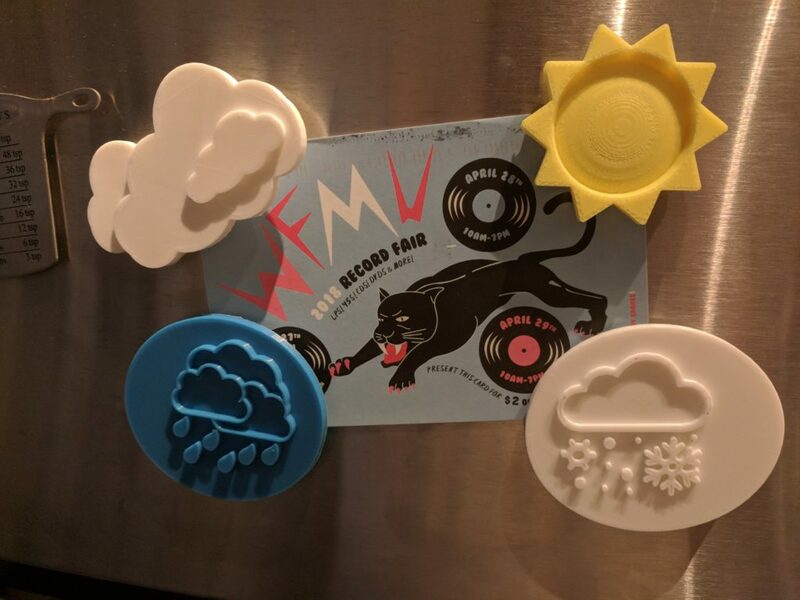 You’ll also be able to get some nifty 3-D printed magnets with a contribution as low as $5! Above are four of the five designs. Since you’re here reading this, why not check out the stream below? Sarah and I will be doing another trial run of the piece this week at the Museum of Human Achievement. It’ll be Thursday in an early show. The featured set of the night is Adam Goodwin, a bassist from Berlin.